With her critically acclaimed, bestselling first book, Scent of the Missing, Susannah Charleson was widely praised for her unique insight into the kinship between humans and dogs, as revealed through her work in canine search and rescue alongside her partner, golden retriever Puzzle. Now, in The Possibility Dogs, Charleson journeys into the world of psychiatric service, where dogs aid humans with disabilities that may be unseen but are no less felt. This work had a profound effect on Charleson, perhaps because, for her, this journey began as a personal one: Charleson herself struggled with posttraumatic stress disorder for months after a particularly grisly search. Collaboration with her search dog partner made the surprising difference to her own healing. Inspired by that experience, Charleson learns to identify abandoned dogs with service potential, often plucking them from shelters at the last minute, and to train them for work beside hurting partners, to whom these second-chance dogs bring intelligence, comfort, and hope. Charleson has trained search and rescue dogs for years and when the stress of doing her job builds up that she begins experience panic attacks, she finds herself in need of some rescue. Her love of dogs and the fact that she notices how her search and rescue companions create calm in a horrible situations, leads her to discover their healing power. She embarks on training her own service dog to support her own invisible disability. To be honest, when I first saw the title of this book, I had misread it as The Possibility OF Dogs, but in some sense, this really is just as true a title since all dogs have a lot of possibility. I adored Charleson's first book, Scent of the Missing, and she does an amazing job with describing the work that goes into training a service dog and the fact that it doesn't matter whether the dog is young or old, pure-bred or mutt, almost any dog can be a helpful companion with a little work. My heart dropped when I read about the two missing dachshunds and she relates that a recent rise in neighborhood crime is also feeding the need for bait dogs in fighting. I had no idea that pets could be stolen for such a use. As Charleson finds her perfect match in Jake Piper - you have to check out his facebook page - you can see how this one small bundle of love conquers and becomes the partner she needs to help her cope. There are short stories as well about other dogs that are helpful to seniors, autistic children and those first responders so devastated by the work they do. She even mentions the frantic social media postings about rescue dogs that have reached the end of the line at shelters. One really caught my heart since it is in my hometown of Huntington Beach, CA, as she discusses Compassion fatigue. There are only so many rescue people to go around, not to mention the expense involved. I am glad Charleson was able to rescue the little dog from here but it makes me sad that there are not enough local people to help. This is such a wonderful read for any dog lover. 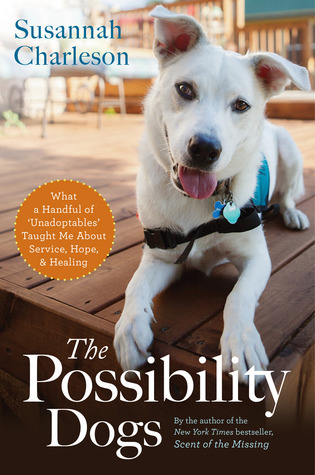 Susannah Charleson is the author of the New York Times bestseller, Scent of the Missing, as well as a flight instructor, service dog trainer, and canine search-and-rescue team member, who most recently began a non-profit organization called The Possibility Dogs, which rescues, trains, and places dogs with people suffering "unseen" disabilities. She lives with her search partner, Puzzle, a golden retriever certified for the recovery of missing persons, her service dog partner-in-training, Jake Piper, a German shepherd-pit bull-poodle mix, as well as a rabble of pomeranians, a chihuahua-cairn terrier mix, and two cats. I know I read very early – we have family pictures of me doing so, but none of the titles have stuck these fifty years later. My earliest true reading memory is of my second grade teacher sending a note to my parents about my reading Gone With the Wind during reading period in class (she wondered if that was acceptable to them). I also remember Susan Coolidge’s What Katy Did and What Katy Did Next. I know I loved the Noel Streatfeild’s Shoe books. Party Shoes was the first one I read. I am currently re-reading Patrick O’Brian’s brilliant Aubrey-Maturin naval series – this is my fourteenth voyage through the 20-book canon. I am also reading Natalie Serber’s Shout Her Lovely Name, Hallie Ephron’s There Was an Old Woman, and Kate Atkinson’s Life After Life. Xeriscaped! I live in Texas. Plus, I hover over a clutch of carefully-tended roses. The garden could use a little weeding, but hey! everything in moderation, even virtue. Dyspraxia. I am working with a service dog handler now who has it. Next-to-the-last thing was dragonfruit. As in, how to prepare it. The sound of Styrofoam squeaking. When anything is said to have a “vibe.” When competing chefs serve Scott Conant raw red onions on Chopped. Contest ends on 6.23.13 Winner will be chosen by Random.org and posted in comments. This giveaway is sponsored by HMH and ONE copy is available. I really enjoyed Scent of the Missing. Dogs are amazing. What a wonderful story. I loved the James Herriott books and in one he was comforting a lady who was concerned her dogs wouldn't be with her in heaven. He told her he couldn't see how an animal with such a loving soul wouldn't be. I'm glad they are getting credit for what us dog lovers know they do every day. I had to google "Xeriscaped"--it doesn't sound like something I could do in my climate, but sounds like a great way to be a thoughtful landscaper! Thank you!! this looks soooo good!! I have "Scent of the Missing" near the top of my tbr pile. I have heard great things about both books, and the author. I'm not on facebook or twitter. This looks like a fun read, and warm hearted. Thanks again Mary & Susannah!